Bygones album championed by iTunes, MySpace, LA Weekly... you? Hot on the heels of Bygones' album debut last week, the music mega-monoliths iTunes and MySpace Music have both championed the new power-duo featuring Zach Hill (drums, vocals) and Nick Reinhart (guitar, bass, vocals). iTunes featured the album on the front page of its Alternative Rock section, while MySpace showcased the band on its front page as well. Likewise, LA Weekly featured the band's deluxe vinyl edition in Chris Martins' Inches column. Bygones is, to a certain degree, the optimal outcome of a musical marriage of Hill's band Hella and Reinhart's group Tera Melos. Considering that those bands don't need words to get their point across, logically, a project bred from their members is equally successful at rendering listeners speechless. Check out the MP3 for "Click On That (Smash The Plastic Death)" HERE. Bygones' debut album by- will most certainly render even the most loquacious and easily-distracted dumbfounded. It's a sinewy, wired mass of riffs and rhythms tightly wound around a uniquely pop heart. The duo fits more riffs and ideas into one song than most bands fit into a whole album. It's tireless, and nearly infinite in the sheer quantity of ideas to unravel. Bygones debut album by- was released by Sargent House on August 25th on both CD and 12" Vinyl. The rapidly rising indie label Sargent House is offering a free sampler of its diverse roster of bands beginning this week via AmazonMP3. The 12-song compilation features tracks by RX Bandits, Bygones (Zach Hill & Nick Reinhart), Good Old War, Maps & Atlases, Tera Melos and Red Sparowes. The label sampler includes two singles currently at radio, "My Lonesome Only Friend" (MP3) by RX Bandits and "Looking For Shelter" (MP3) by Good Old War. See full track listing below. Amazon is currently honoring the indie label on its front page, adding it to the ranks of the online retailer's other championed imprints. The entire free compilation is available HERE. 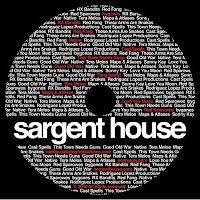 Sargent House is a Los Angeles based management company and record label. It was founded in June 2006 by Cathy Pellow who also owns music video production company and syndicated television show Refused TV. Pellow began managing the metamorphic rock outfit RX Bandits in 2006. The band needed to release its new album ...And The Battle Begun so Pellow decided to launch her own record label (largely out of interest in doing things differently from the traditional model of record labels.) From that point onward, Pellow continued to manage bands and release records, all under the Sargent House banner. Listed chronologically from when Pellow first began working with them, Sargent House currently manages the RX Bandits, These Arms Are Snakes, Maps & Atlases, Russian Circles, Tera Melos, Daughters, Red Sparowes, Red Fang, Good Old War, Native, Bygones, Zechs Marquise and Zach Hill. Additionally, Pellow also helms the Rodriguez Lopez Productions imprint, founded by The Mars Volta guitarist Omar Rodriguez-Lopez. Sonny Kay came from the Gold Standard Labs label as art director for Rodriguez Lopez Productions (RLP) and Sargent House. RLP launched in March 2009, with its first release by El Grupo Nuevo de Omar Rodriguez Lopez titled Cryptomnesia out in May 2009. Currently, all Sargent House managed bands also have a release on the SH label. Drummer Zach Hill is the most recent management and label signing. His next solo album, Face Tat is slated for release on Sargent House. 03. Maps & Atlases "Ted Zancha"
04. Bygones "Click On That (Smash the Plastic Death)"
05. This Town Needs Guns "Chinchilla"
06. Tera Melos "A Spoonful of Slurry"
08. Native "Ride The Tide"
10. Love You Moon "David's Birthday"
11. Cast Spells "Glamorous Glowing"
12. Red Sparowes "The Fear Is Excruciating, But Therein Lies the Answer"
Good Old War starts full US tour while Triple A radio embraces new single, "Looking For Shelter"
Acoustic folk trio Good Old War launches yet another extensive US tour this week, this time with Brooklyn's lauded indie group, The Honorary Title. While the busy band has spent much of the summer on tour (including dates with RX Bandits & Dredg), it has also reigned large on the radio. Their recent performance on the nationally syndicated Acoustic Cafe program marked a high point in dozens of live on-air visits for Good Old War. See upcoming radio appearances and tour dates below. Good Old War's tremendous three-part harmonies and flawless performances prove their deft musicianship, as evidenced in this recent on-air performance at WTMD in Baltimore. Recently, Good Old War was among the top most added on the Triple A (Adult Album Alternative) radio charts for the new single, "Looking For Shelter" (MP3 HERE.) While the band's lulling harmonies have already caught fire with younger listeners, the Triple A commercial & non-commercial radio attention is glowing testament to Good Old War's vast appeal. In fact, many fans were so inspired by the Pennsylvania group's Sargent House debut, Only Way To Be Alone they've posted cover versions of Good Old War songs to YouTube. Alternately, check out the official video for "Weak Man" HERE. David Davison's Cast Spells released its debut EP Bright Works and Baton on Sargent House today. The Maps & Atlases frontman's side project immediately landed on iTunes' front page "What's Hot" section. Bright Works and Baton has already garnered considerable critical praise, including this insightful review from Stereo Subversion. Following extensive touring and a bunch of festivals with his band Maps & Atlases, Davison took Cast Spells out for its first tour ever with So Many Dynamos in July. ZIP files and CD copies available to press for review upon request. Acclaimed Los Angeles trio The Happy Hollows have announced the release of their debut full length in October. The album, Spells is a culmination of their work with producer and former Mighty Lemon Drops guitarist David Newton (The Little Ones, The Blood Arm), who also produced the group’s 2008 EP Imaginary. The young group's infectious and irreverent noise-pop has earned considerable following up and down the west coast, with their energetic and charismatic performances. Vocalist/guitarist Sarah Negahdari wields ominous riffs and finger-tapped arpeggios while singing with a cherubic-yet-mischievous grin. Meanwhile, the agile rhythm section of Charles Mahoney (bass/vocals) and Chris Hernandez (drums/vocals) vault and lunge with precision. Listen to MP3s for "Faces" (HERE) and "Monster Room" (HERE). Stream the full album here. 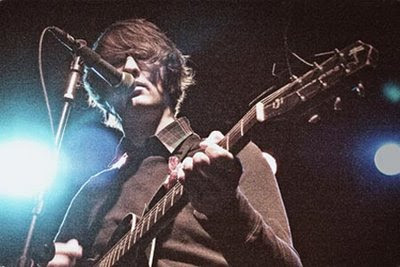 Having born and bred their band in various corners of the L.A. music scene since forming 2006, The Happy Hollows played their first shows in Japanese restaurants, laundromats, and small local clubs. In their first year as a band, they snuck into a studio at night and, in two sessions, recorded Bunnies and Bombs, an EP that attracted the attention of the L.A.'s underground music scene. 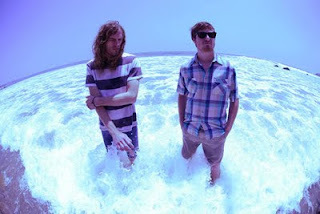 After seeing them play a show, established L.A. heroes Silversun Pickups asked The Happy Hollows to open for them at The Wiltern and The Fillmore. 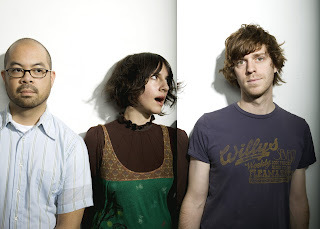 In 2008, fellow art-rock outfit Deerhoof invited the Hollows to open for them on their album release shows at The Avalon and The Great American Music Hall. 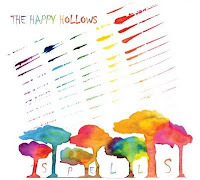 In October 2009, The Happy Hollows will release their debut album entitled Spells. The 14 tracks on Spells encompass the wide range of structures and musical ideas that The Happy Hollows bring to the table. The album’s opening track, “Faces”, begins with a crunchy guitar hook strummed by Ms. Negahdari on her Gibson SG. The song takes an unexpected twist with the introduction of the drums and bass, and yet another turn when Negahdari’s irresistible, chanteuse style vocals begin floating over the music. Track 3, “Silver”, is a gritty and danceable song that shows off Ms. Negahdari’s unconventional lead guitar technique. On track 5, “Lieutenant”, the band demonstrates their technical chops as well as their ability to compose songs with non-traditional structures. 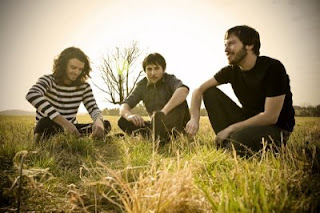 Two of the later songs on Spells, “Father Time” and “Turtle and Hare”, highlight the band’s more eerie and melodic side. In summary, Spells is an album which is at once catchy and innovative. It is gritty, loud, and ambitious, while not shying away from the use of melody and the employment pop sensibility. Written and recorded over a period of two years, it will certainly stand as one of the definitive statements of the Los Angeles and indie rock music scenes in recent memory.